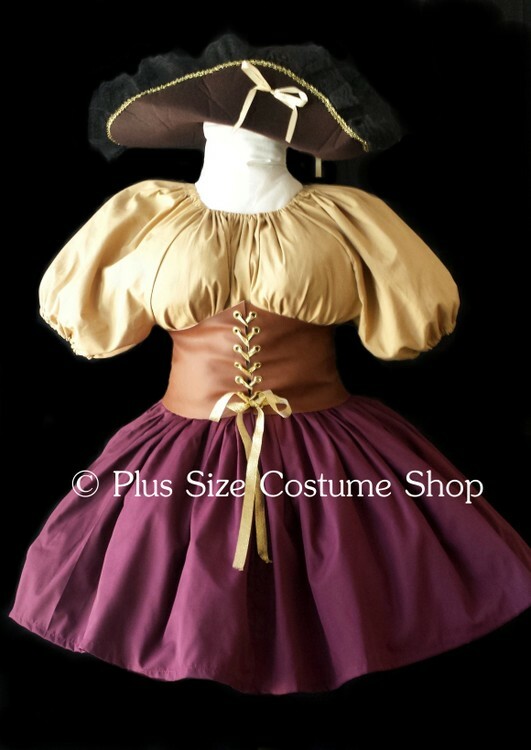 Plus Size Costume Shop carries a full line of professionally hand-made Halloween costumes, Renaissance garb, bridal gowns, Christmas costumes and historical clothing in sizes 1X (18/20W), 2X (22/24W), 3X (26/28W), 4X (30/32W), 5X (34/36W), 6X (38/40W), and 7X (42/44W). The lace-up costume waist cincher is made of brown vinyl. The cincher laces up through professional-strength grommets. The skirt is made of wine cotton. The skirt has an elastic waist for comfort. The skirt will be hemmed at 24" in length (approximately knee-length on someone of average height) unless a specific shorter length is requested.